This is the 10th edition of this priceless historical fiction of Akilan. This new edition comes in a deluxe bound, with authentic photos and map. The novel is based on the life of vishwanatha nayaka of Vijayanagar (1529-1564) the founder of the nayaka kingdom in Tamilnadu who devoted himself to the unity and integration of the country. PAANDIMA DEVI: This is one of Deepam Na.Parthasarathy's popular historical novel. 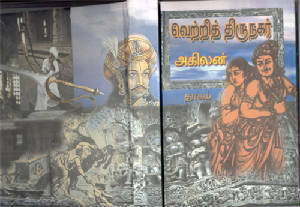 This novel is based on the period of 3rd Rasa sima pandiyan who ruled then pandi nadu. This novel proudly depicts our Tamil philosophy and culture.